Time was, impressing your guild simply meant barrelling through a series of quests in your off-time from being the Grey Fox. Now, though, the Elder Scrolls is a massively multiplayer affair. From Update 3 onwards, that means flying the colours of your group at all times – whether through armour dyes or bibs emblazoned with their emblem. 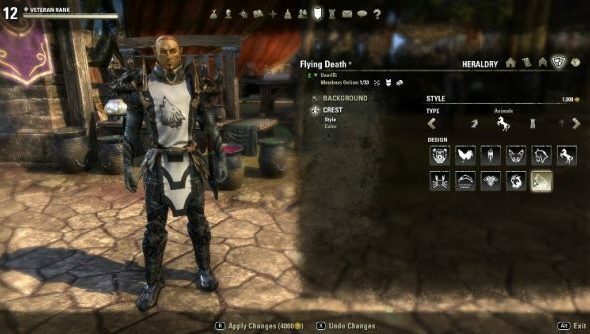 Update 3 is due on ESO’s Public Test Server shortly, and has made guilds and player customisation its business. Guild leaders with ten or more members under their command will soon be able to design heraldry for their troops, pieced together from some of the game’s 250 colours, 63 backgrounds and 136 crests. Guild members can buy and wear them as tabards, before strutting through Daggerfall together like a proper gang. Of course, it’s not single player where guild colours will prove most practical. You’re unlikely to have trouble distinguishing your guild teammates from flame atronachs or mudcrabs, after all. It’s the idea of uniformed units facing off across ESO’s militarised Cyrodiil in PvP that’s legitimately exciting. Elsewhere in Update 3, guild leaders will be given powers to create, delete and promote guild ranks – presumably based on how proudly members are wearing their guild heraldry. Zenimax say “almost all” of the new guild features due before the end of July came about through fan feedback. Are they what you wanted? Or did your participation in ESO end with our Nick’s equally colourfulElder Scrolls Online review?